As promised, I am attempting to keep our visitors up to date on the progress of our vacation. Our villa was immaculate. It had 3 bedrooms, each with their own bathroom. A very spacious kitchen, dining area, and living room. Outside we had a lovely covered deck right off the 6th hole of the resort golf course. In the event you attempt to put this villa in your GPS, it will need to be entered as 91 Colonnade (actually address was 195 Colonnade), Hilton Head Island, SC 29928. 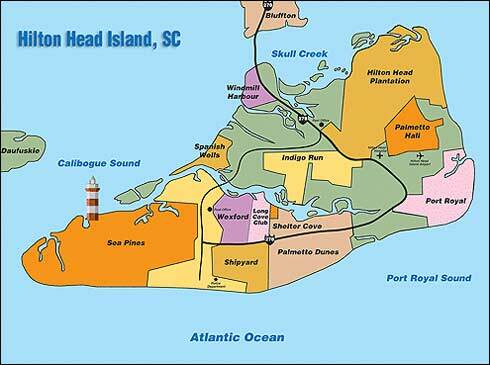 The link to the villa can be found here at Resort Rentals of Hilton Head. This was a superb find and very affordable, especially when you can split the price with another family. In our case, my inlaws are going in “halvers” with us. The rate for the week came to $1386.45. Here is a link to the actual unit we will be staying in (LINK). There were a set of towels furnished for all of us including wash cloths. This worked well because the villa included its own washer and dryer. Room #1: Was a room with (2) twin beds and a bathroom entrance from both the bedroom and the hallway (with doors of course). Room #2: Was furnished with a queen bed and its very own bathroom and walk-in closet. Room #3: Was furnished with a king sized bed, a walk-in closet, shower and jacuzzi. This was our room. Our first order of business after arriving was to stock up on groceries. Having a villa and fully utilizing the convenience to us includes the ability to cook your own meals. A tremendous savings and you’re always pleased with the quality of both the food and the service. That being said, all tolled, we only ate out 2 times the entire stay. Groceries for the whole week for all (6) of us was about $250.00. If you figure, (3) meals a day times (7) days, that’s 21 meals for the price of $250.00. That’s $35/day, divided yet again by (6) persons that equals $5.95/day per person for our meals. I’ll post another update tomorrow about some of the specifics of the vacation in terms of the beach, shopping, what meals we did eat out, our day trips, and some of the stormy weather we encountered. We even sat through one of the dreaded condo sales pitches (not recommended). Really enjoy keeping score on the Garmin Approach G5 GPS also a very intuitive process. Play rounds where someone in group has used a rangefinder and find the Garmin to be just as accurate and much quicker to use – you just look at the screen to see the distance to the flag without having to line it up or press any buttons.The screen is easy to read in sunlight even with polarized sunglasses.